Valentine’s Day will be here before you know it and it’s the perfect excuse to beat cabin fever with a fun playdate for your kiddos! Forget cooties, this playdate only has love bugs! I’ve teamed up with one of my favorite party shops, Sprinkles & Confetti and one of my favorite designers, Just Add Confetti to bring you lots of fun ideas to throw this Valentine get together and one lucky winner will win an entire prize pack! Don’t forget to enter using the widget at the end of the post! Throwing a festive playdate is easy as 1-2-3! The love bug look is easy with black, white, and red party goodies. Some paper plates, paper straws, and balloons are all you need and make for easy cleanup. Sprinkles & Confetti makes it even easier by shipping it all to your front door. This has come in handy for all kinds of occasions including my recent birthday girl’s trip and a bridal shower I hosted this summer. No errands required and everyone always compliments how cute it all looks! Grab Your Free Love Bug Printables! Just Add Confetti has designed the most adorable set of printables that are available for free on her blog! Printables are one of my favorite ways to to quickly add pizzazz to an event without a ton of work. Last year, I had a blast creating some of my own printables for a Love Potion themed bar. 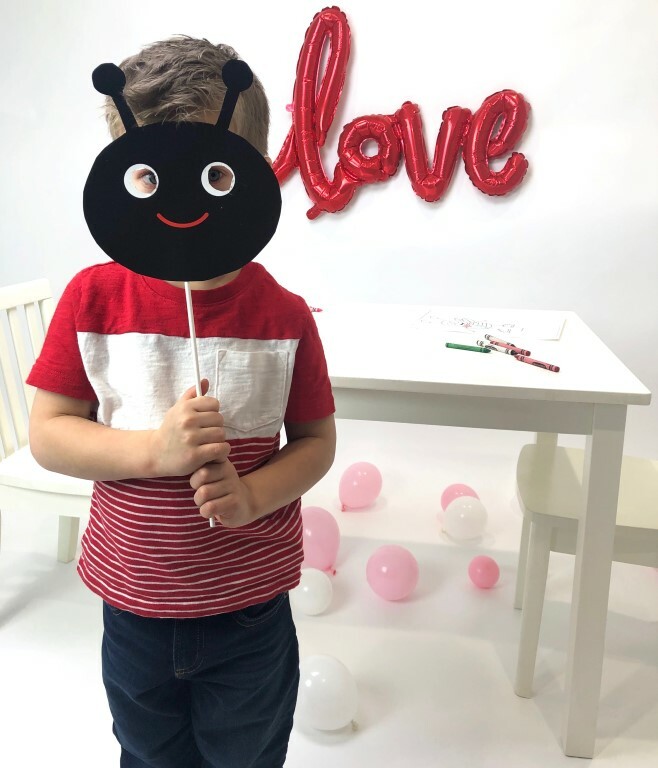 In addition to cute drink wraps and the heart banner, Alison also put together everything you need to make an adorable DIY love bug backdrop using cut bug faces, dots, and honeycombs. The winner of our giveaway will also get two fun classroom Valentine designs! If you aren’t the lucky winner, you can grab these in Just Add Confett’s Etsy shop. Snacks can be simple for a playdate, but I love adding little DIY details to keep the theme going! I’ve seen various versions of a love bug snack, but decided to give it my own spin. You might remember the similar reindeer pudding cups that I made for my Rudolph The Red-Nosed Reindeer Viewing Party. Parents can make the snacks in advance with the kids or make it a playdate activity! Start by flipping the fruit cups over. Use washi tape to divide the cup in half. Glue on googly eyes. Next, use sharpies or other markers to draw dots on the pudding cups. Then, glue on foam heart cutouts as feet. Next bend pipe cleaners to make antennas and attach them with glue. Add on two more foam heart cutouts. You can also order themed cookies from a local baker. If you are local to Minnesota, I recommend checking out The Polka Dot Cookie who made these adorable treats for the playdate! Kids can also enjoy some themed coloring pages, simple games, and some good old fashioned silly photos! Photos can be fun for all ages! Got older kids? Make sure to check out last year’s Valentine photo fun for the tween crowd. In addition to the party supplies, you can find a link to the coloring page on the Sprinkles & Confetti blog. Now, make sure to enter for your chance to win this fun Love Bug Playdate pack for you and your family! Use the widget below to enter with your email address. In addition, you can earn extra chances to win by visiting Just Add Confetti, Sprinkles & Confetti, and me on social media! The winner will be contacted via email and the giveaway is open to U.S. residents only. Good luck!